The sunrise yesterday. The first time the sun has been around in the early morning since almost a week ago. The last image is the sky yesterday as well, except at sunset. The two pics sure look similar. Once in a while it helps in this dreary, rainy weather to be reminded of sunny times and butterflies and even a wasp now and then would be OK.
As I look out at the brown water, the river reminds me of a highway sometimes. Looking out at it today from my desk, I see birds flying up the river, and then I see some going the other way. They are doing this in the rain. There are ring-billed gulls, and double-crested cormorants, and Forster’s terns. And once in a while the osprey passes on patrol on its way to who-knows-where. It stops in a tree on the opposite bank from our dock and just sits there. After a while it takes off and goes down the river back the way it had come. Wood ducks have been flying all day, I guess in response to the cloudy, rainy weather. They don’t stick to the river though, they just seem to criss-cross it, coming and going with no visible destination – at least not one you can understand if you can’t fly. And the river highway is carrying a lot of traffic today, all of it going in one direction, south. I’m looking at rafts of debris of considerable size. The one I see is probably sixty yards long and twenty wide. I see several logs that would be big enough to help float my raft, if I wanted to go out in the rain and catch them, which I don’t. The raft is floating just fine. The rest of the material is jumbled up branches and vegetation. The debris, or drift, as Myette Pt. fishermen call it, seems to be cleaner today than it sometimes is. There are no Igloos or Styrofoam chunks being carried down the highway to the Gulf, at least right now. Experience teaches that there is more of this drift traveling along the bottom of the river/highway than you can see on the surface. A lot of stuff just barely floats, or doesn’t float, and it just rolls along and tumbles along the bottom until it reaches a place where the forces of the current weaken and can’t push it anymore. And then it settles down to become a piece of the bottom environment. Until, that is, a bigger rise in the river picks it up again and helps to further its journey to the Gulf. The stuff traveling on top of the highway will get hitchhikers from time to time. Some of the drift today was carrying a great blue heron perched in the rain on a floating stump, and other stuff carried a couple spotted sandpipers. They were running up and down the logs jabbing at small live things that were good to eat – fast food along the road. Cormorants often float along with the drift, but don’t seem to be too interested in diving. Yep, not too surprising that the river as a highway appealed to us too. My ancestors came up Bayou Teche and settled in the New Iberia/St.Martinville area. Many people living here now got here that way. But, you would want to be careful if you went out on the highway right now, at least the Atchafalaya highway. It is high and fast, like a big moving walkway on a long concourse. It can surprise you with things coming at you fast on the surface, and things coming just as fast but unseen below. The river is at 16 feet on the Butte La Rose gauge right now, falling from that in the next few days. The Mississippi and Ohio are both falling all the way up, so this rise doesn’t look like it will be sustained. The crawfishermen better be careful where they put traps this week, if the water falls next week they might have to walk the swamp to get them. 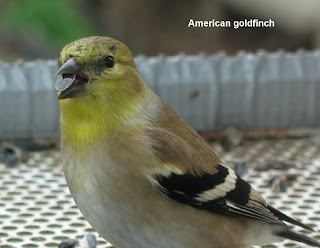 A goldfinch at the window feeder this morning. There are many of them coming to the feeders right now. They do like black-oil sunflower seeds. Some things stick in your memory so hard that you wonder how an impression so solid can have taken place outside of a dream. But some things do that, I think. One such event happened to me when I was ten years old. Now, after 58 years of living past that time, the difference between accurate memory and that which I might have created could be questioned. Maybe some things are remembered the way I wished it could have been, maybe not. I don’t know, but I do know that if it didn’t happen this way, it should have. All children deserve a trip like this, provided it can be safely done. Or if not all children, then at least those children who are privileged to have an early sense of wonder at the outdoors. In earlier posts I mentioned the man who introduced me to the Atchafalaya Basin - Rut Gajan. He was a beer (Falstaff) delivery-truck driver in New Iberia where I grew up. He was a gruff man, and not easily liked, I think. But when that window of opportunity defined by age came open, he was the guide/mentor that presented the world of the Basin to me. Looking back, I’m not sure I liked him in the usual sense, but I would have followed him into the darkest night looking for the meanest alligator without a moment’s pause. And if I had done that he would have had no words of praise for my success or loyalty, he just expected me to do well whatever he showed me, once, how to do. Luckily I got more of what he taught me right, than not, because his quick displeasure was hard for a ten-year-old to take. This story is about a fishing trip to a place in the Basin called Lost Lake, a prophetic name as it turns out. The picture shows the lake as it is now, only a little bit of water in a couple of places. But back in 1948 the lake occupied almost the entire triangle bounded by the Atchafalaya River and the Butte La Rose Cutoff canal. The triangle is obvious in the picture. I had never heard of this lake before Rut picked me up before daylight that morning. As a matter of fact, it was in the opposite direction from where he usually launched his boat. We usually went south to Charenton, but this time he drove all the way to the Butte La Rose landing. How we got there I don’t know, there was no interstate highway system yet. We must have gone from New Iberia to St. Martinville to Henderson to Butte La Rose – all of this on the only roads available back then. I do remember that to get to Henderson from Breaux Bridge you had to turn right at the Atomic Bar on the road to Cecilia, I believe. Anyway, we launched the boat and he started the old Mercury outboard he had then. We went down the Atchafalaya River for a mile or so and he slowed the motor and pulled into the left bank. We tied the boat and he told me to start unloading the gear we would need to fish that day. I still didn’t know what we were doing, but he told me to carry my stuff into the woods along a small trail leading back into the swamp. As I did this and he came up and passed me along the trail, two pirogues appeared floating in very shallow water at the end of the trail. As is usual in the Basin, the dividing line between flooded swamp and dry swamp is just a shallow leading edge of water. One moment you are walking on muddy ground and the next you are wading. But to a ten-year-old those pirogues appeared as if by magic. I still don’t know how those boats got there but he or someone he knew put them there, of course. So Rut told me to put my gear into one of the pirogues and to follow him as he took the other one. The trail, now flooded, continued back into the swamp through the willow trees. I did this and as we paddled through the trees it was a strange feeling to be functioning sort of independently in my own pirogue behind this man who knew everything about absolutely everything in the swamp. All at once I felt like he became a guide rather than a teacher, at least for that moment. There is a difference, almost like being suddenly cut off from a lifeline that you’re not quite ready to release. But I didn’t know how true this was to be, that day. We paddled through the trees and as we went they changed from willow to tupelo and cypress, and then they got thinner and thinner until we emerged from the forest out onto an area that was mostly buttonbush and open water. Wow. This was a big lake, but there were places in it where clumps of cypress prevented seeing all the way across it in any one direction. Rut turned to me from a short distance away and asked “Do you have your lunch, and water?” Yes. “Do you have your bait?” Yes. Then “You stay here and fish for bream and goggleeye; I’m going to go and fish for bass. I’ll be back later.” What? Going where? How much later? But you know what, I didn’t dare ask. Looking back, I believe while being very unsure of the situation, I felt I was being treated like an adult with the full expectation that I would be all right by myself for God knew how long in a very small boat in a place I had never been before. I’m not sure if he knew whether I could swim or not (I could). But I trusted him, I guess, because I watched him paddle away out of sight. The lake was in two big sections. As he went into the far section, he whistled a tune that stayed with me a long time, but is gone now. I had a brand new Conlon fiberglass flyrod, and an automatic reel. And I had worms and crickets. And the day was mild and partly cloudy with not much wind. How can you not feel good at a time like that? I paddled to a place with some debris in the water and baited with a cricket. I dropped the bait in the water and fished the flyrod like a cane pole. The line zipped away and I lifted the rod which began to resist the upward motion more than I expected. I could see the leader zigzagging around in an S trail and after a little while managed to lift the fish to the surface. It was a big choupique. Disappointed, especially considering I was not too sure how to get past all those teeth to retrieve my bream hook, which I couldn’t see - I did the only intelligent thing I could think of, I cut the line. With a new hook on and baited I tried again. And again, the line zipped away and I lifted the rod. This time the weight wasn’t as heavy to lift but it was still hard to bring the fish to the surface. When I did, it was the biggest bream I had ever seen. I realize I was only ten years old but, even so, by that time I had seen a lot of bream and caught some pretty big ones. This thing was huge, it seemed to me. It was almost black, but it had a dark rusty brown color on the belly. There was no thought of holding it in one hand and removing the hook with the other. I had to pin the fish to the floor of the pirogue with my foot while I put the rod down and removed the hook. At that point I believe Lost Lake became a permanent memory. I didn’t have an icechest or anything like that. If we had one it was back in the big boat at the river. I did have one of those fish stringers with the things like shower curtain hangers on it – big snap rings I guess they are. So, I put the fish on the lowest ring by impaling it through the lips and went back to fishing. I don’t remember how many of these big bream I caught, along with a lot of big goggle eyes. It was a lot. I just kept putting them on that metal stringer, one after the other. The hours went by and I ate lunch and went back to fishing. It seemed like anywhere you put that worm or cricket down, there was one of these outsized fish to eat it. Sooner or later it dawned on me that I should have been running out of room on that stringer, but it seemed that I wasn’t. I remember very vividly pulling the stringer all the way up so I could see the far end of it, and seeing two snakes latched onto two of my big bream. I know I had caught at least 50 of those huge fish, and some very large goggleeye too, and now I was looking at only ten or twelve left on the stringer. I beat the snakes off with my paddle and, from that point on, I periodically lifted the stringer out of the water to check for snakes. And I did find some more, they kept coming back. But, how come I had so few fish? Common sense told me that I couldn’t have put so many big fish on that stringer, but it was common sense after-the-fact. It was just like a possession almost, catching fish like that. I now know that the big fish were tearing themselves off of the metal rings, probably almost as fast as I put them on. If they didn’t have the motivation to do it alone, the snakes surely provided whatever necessary additional motivation. Still in all, the stringer had about 15 fish on it, and it was not easy to lift into the boat. How big were these bream? There are two bream mounted in the main 1st floor meeting room at the Dept. of Wildlife and Fisheries. These are in a case at the back of the room. My fish were all at least that big. I remember that several of them went well over two pounds. Well, even a day like that comes to a close. I was just about out of bait, and the sun was low in the sky. Where was Rut? Up to this point I think I had forgotten that I was alone, almost. I looked at the place where I had last seen his back disappearing into the swamp. I looked at that place a lot as it got later. 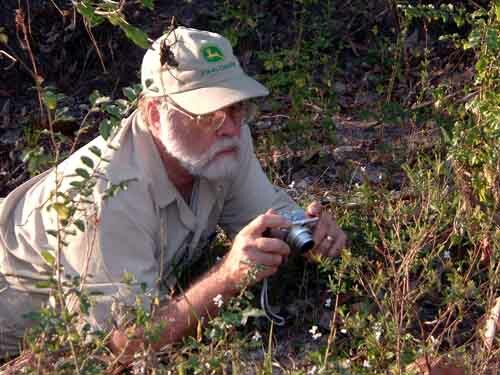 I expected to see him show up between the trees and the buttonbush clumps, but it was the sound of him whistling that sent the wave of relief over me. Maybe that’s why the tune stayed in memory so long. When he reached me and saw the fish I had, and heard of those that I lost, he actually acted impressed. He never said anything complimentary, but he was impressed. And that was more than I had ever seen in the relationship between him and me. Seeing this reaction in him, I remember feeling like the pirogue I paddled back to the river didn’t quite touch the water. And the paddle, even at the end of a very long day, was lighter than when we came to the lake in the morning. And, oh yes, Rut did catch a bunch of bass in the other part of the lake. He had several five-pounders with him. 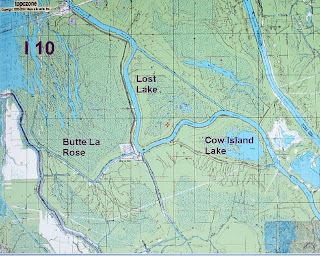 I have never been back to Lost Lake. 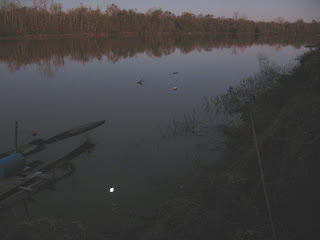 Ironically, it is just across the Atchafalaya River from our house now. But in those days, it was a long way from New Iberia, and fishing it required the transfer of boats from the river to the lake. Since then, the lake has dried up to the point where there are only the two small patches of water in it, and sometimes not even that much. And I have never caught bream like that again. Today you hear of the Florida strain of bream, the ones that get so large so quickly. But this was not those foreign fish, it was our own Louisiana bream living in a lake that provided food and the other things that allowed them to grow to a size seldom seen anywhere at any time. It was my privilege to be in the right place at the right time. But now? Would I leave a ten-year-old in a pirogue by himself in a swamp lake for most of a day, knowing what kind of bad things can happen? Would I leave him alone and just paddle away? No, not any ten-year-old that I have ever met. And by doing that, I would deny him whatever good can come of that experience too. The river is at 13.8 feet on the Butte La Rose gauge, rising to 14.9 feet by next Tuesday. The Ohio and Mississippi are both still rising, but more slowly. It may be enough to hold the water we have now for a while. The crawfishermen are happy, at least those I know well. It was, it was a gray day today. It was warm, warmer than the river is. And the mist rose from the water all day. 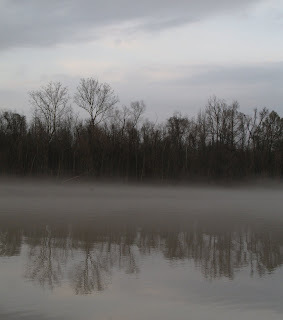 It was never thick, just wisps of mist that floated over the water, sometimes rising in thin arms of wet, thick air, and then descending again to rest near the surface of the river. The current is pretty swift right now, but the water just slid by under the mist – not carrying it along like you might believe it would, if they were connected. They are both water but the two phases seem not to know each other, even though the coolness of the water gives rise to the mist. It is a friendly thing to do, to watch the mist rise from the river. Today one of the fox squirrels in our yard died. Not by my hand, but by the strong talons of a hawk. 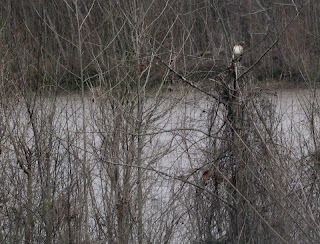 I did not see it happen, but looking out of my window I saw the hawk sitting in a tree at the river. It was just sitting there, not a thing done by red-tailed hawks in our yard very often. Once in a while they will rest in our trees, but always in big ones, not small trees. This one was in a small tree. I got out the binoculars and watched him for a while. I could see that he had something in his right foot. It was rusty orange colored and had to be a fox squirrel. The hawk had consumed some of it, the red color showed on the squirrel. After some time, the hawk was joined by another one and they flew off across the river together. I was a little surprised that the hawk seemed to have no easy time carrying the squirrel. Instead of climbing gracefully the bird started from this side and landed somewhat lower on the other side. It appeared to be laboring as it flew. Must have been a very heavy squirrel. The river is at 11.9 feet on the Butte La Rose gauge, rising to 12.4 feet by Wednesday. The Ohio and Mississippi are both rising all the way up, and more rain is falling there now. I had to reconfigure the dock and raft today to prepare them for a high water season, whether we get one or not. Can’t take the chance. In high water you have to get out of the current and setting the raft and dock end-to-end is necessary to do that. My friend Dugan and I braved the dark shadows of the Basin levee Saturday night. We did the Louisiana Amphibian Monitoring Survey along the levee from Ramah (I10) to Bayou Sorrel. We started about 30 minutes after sunset and drove along the levee, stopping at 10 predetermined stops to evaluate the amount of calling activity at each stop. There are 31 species of frogs in Louisiana at last count (more keep coming in). This wintertime time is the breeding season for three species - spring peepers, northern chorus frogs and southern leopard frogs - so we listened for these species and noted the abundance of each at each of the ten stops. It was a really good night, having rained a lot over the general area the previous week. We use a system that designates a C ode 1, Code 2, or Code 3 for the abundance of each species. A Code 1 means just a few frogs are calling and it’s easy to pick out individuals. A Code 3 means there were so many calling that it is just a loud wall of sound, and forget about picking any one animal out. It’s the Code 3s that are exciting to hear, and there were many Code 3s last Saturday night. Sometimes you just have to stand there and marvel at the sound spectacle of that nocturnal display of frog love in the ditches! Thousands of animals all coming together to a bedroom made by nature for the procreation of more frogs and more frogs. And if you are lucky enough to be able to stand close to them, they are so loud that it makes your eardrums crackle. Nothing shy about these little Romeos, they sing out loud for the ladies. 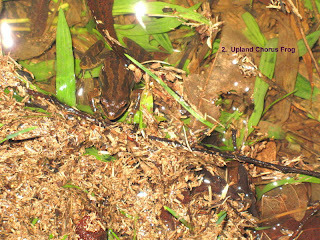 The pictures are of one of the Saturday night singers: the northern chorus frog. It is only about an inch long, but in calm conditions you can hear one call for almost a half mile. I took these pics Saturday night in our front yard. 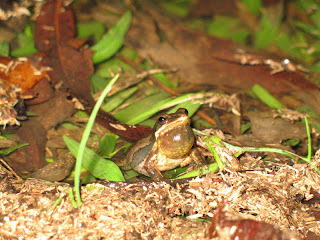 Anyway, we documented that there were lots of frogs calling last Saturday night. Speaking of surveys, during the days between the holidays, the Lafayette Christmas Bird Count took place. Due to various unforeseen circumstances, I ended up having to do my assigned route by myself. That’s not really a problem, you just don’t see as many birds as you do when there are several pairs of eyes searching in all directions at once. Still in all, it was a beautiful day, with clear cold air in the morning and warm at midday. The most notable bird of the day for me was a peregrine falcon before sunup. It was cruising about twenty feet high over a grassy field between me and the pre-sun red sky, about a hundred feet out. A falcon at dawn, a day that starts like that can carry a lot of weight in your memories. The image is easy to recall, when you need the feeling again. The rest of the day was spent trying to identify as many species of birds as I could find, and then trying to count each individual bird. I ended the day with 71 species, down about ten species from past CBCs. The 71 species added up to 13, 700 individual birds, with the majority of that being redwing blackbirds and brown headed cowbirds. I had a good time, and company would be welcome next year. The river is at 11.3 feet on the Butte La Rose gauge, holding steady for the next several days, but the Mississippi and Ohio are both rising hard all the way up and that means more water for us next week. I have just about decided that I will have to trust that this is the beginning of a real high-water season, and I have to fix the dock for those conditions. It’s a lot of work to do that and I don’t want to do it and then have the water just fall again right away. When it goes past 12 feet, I’ll make the shift. The Corps of Engineers says the prediction is that we will have another unremarkable high-water season. Will have to wait and see.